Members of Congress descend to a secure area at the Capitol. I recently examined how Congress’s low approval rating could hurt Republicans in the midterm elections. The national political environment in 2014 doesn’t appear as pro-GOP as it was in 2010. Instead, Republicans running for the U.S. Senate and House in 2014 may have only a slight wind at their back. One of the more interesting critiques of my post was from people pointing to “Fenno’s paradox,” the idea that “Americans hate Congress but love their own congressman,” and therefore, Congress’s overall approval rating doesn’t matter. In my original analysis, I used overall congressional approval rather than the approval of individual members. The former has been asked for a much longer period, and overall congressional approval allows for better testing when trying to detangle its effects from presidential approval in years when the two branches were controlled by different parties. Still, what exactly is the relationship between how someone views Congress overall and how she views her representative? The relationship turns out to be quite strong. I looked at every election for which I could find a national survey taken in the final two months of the campaign that asked whether people approved of their representative and whether they approved of Congress overall. Since 1990, every midterm election has had such a poll. 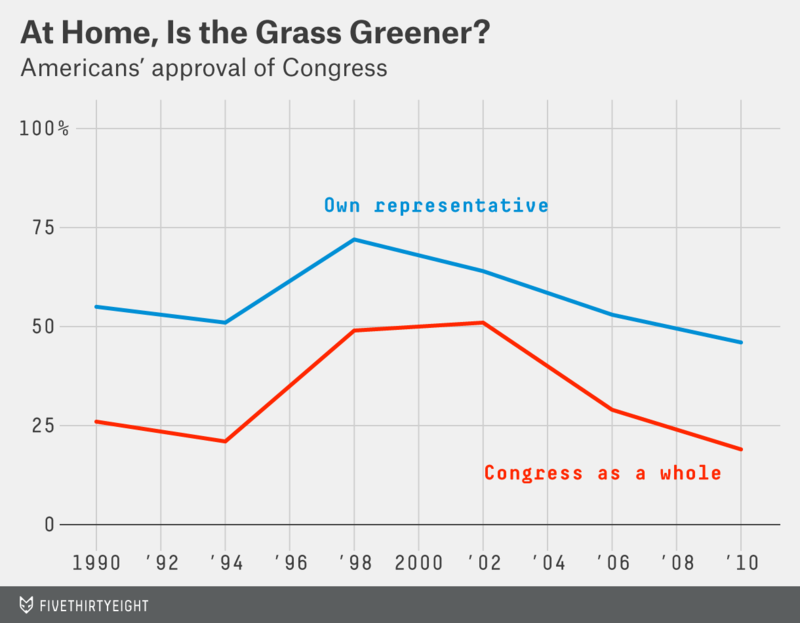 As expected, approval of individual representatives is higher than of Congress as a whole. But the two almost always move in tandem. The correlation, on a scale of -1 to 1, is 0.93. When one approval rating drops in half, the other has a good chance of dropping by half as well. We can also look at two similar poll questions that Cook Political Report’s Dave Wasserman used a few weeks ago in an article for FiveThirtyEight to show the public’s growing distaste for Congress. Gallup has asked respondents before every election since 1992 (except 1996) whether they believe their representative should be re-elected and whether most representatives should be re-elected. These questions show the same pattern as the approval questions. Approval of one’s own representative is always higher than those toward all representatives, but the two flow in unison. The correlation here is 0.94. And yes, overall congressional approval is highly correlated at 0.98 with whether someone wants most representatives to be re-elected. The key is to recognize the scale of these questions. 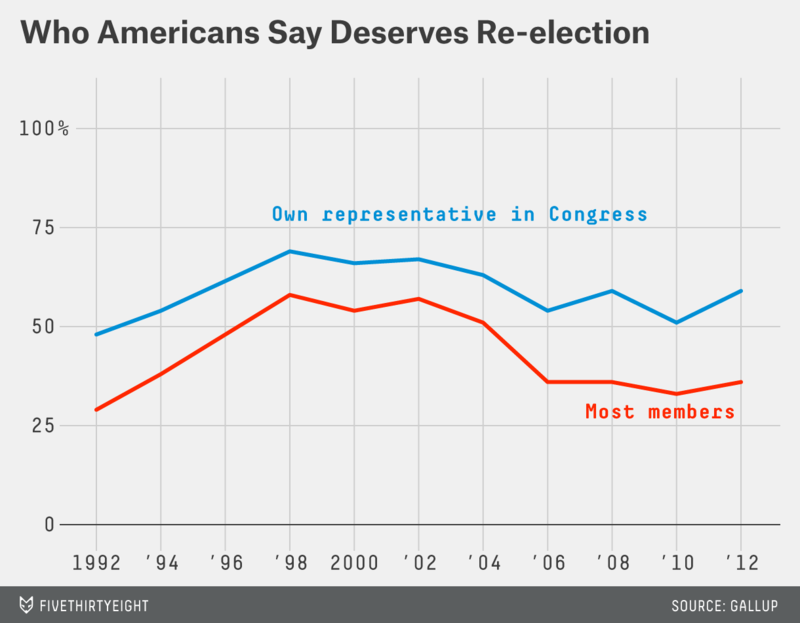 How Americans feel about Congress as a body is directly linked to how they feel about their own representatives. This year, all of these measures are at historic lows and below 50 percent. But that doesn’t mean most of Congress is going to turned out; in fact, a vast majority of members of Congress are going to get re-elected. Still, as I said last week, the public’s dislike of Congress may prevent Republicans from taking full advantage of President Obama’s low approval rating.